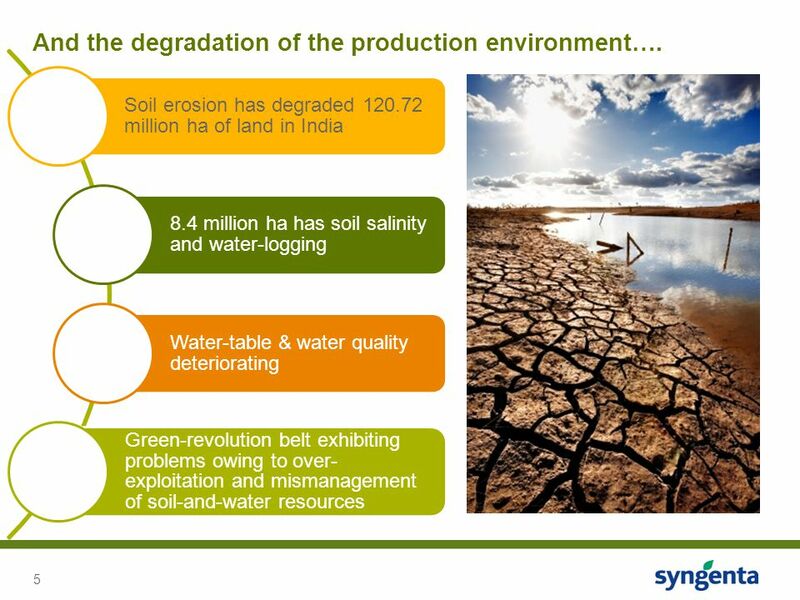 5 And the degradation of the production environment…. 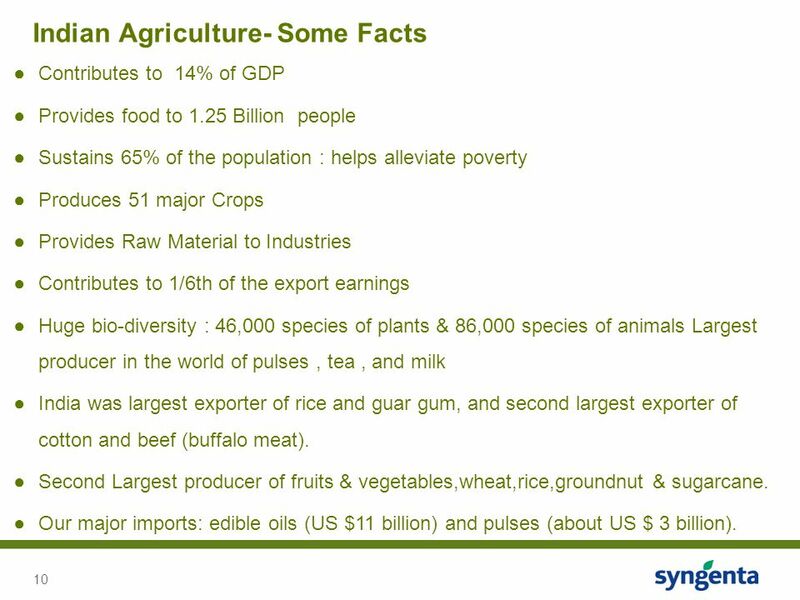 Contributes to 14% of GDP Provides food to 1.25 Billion people Sustains 65% of the population : helps alleviate poverty Produces 51 major Crops Provides Raw Material to Industries Contributes to 1/6th of the export earnings Huge bio-diversity : 46,000 species of plants & 86,000 species of animals Largest producer in the world of pulses , tea , and milk India was largest exporter of rice and guar gum, and second largest exporter of cotton and beef (buffalo meat). 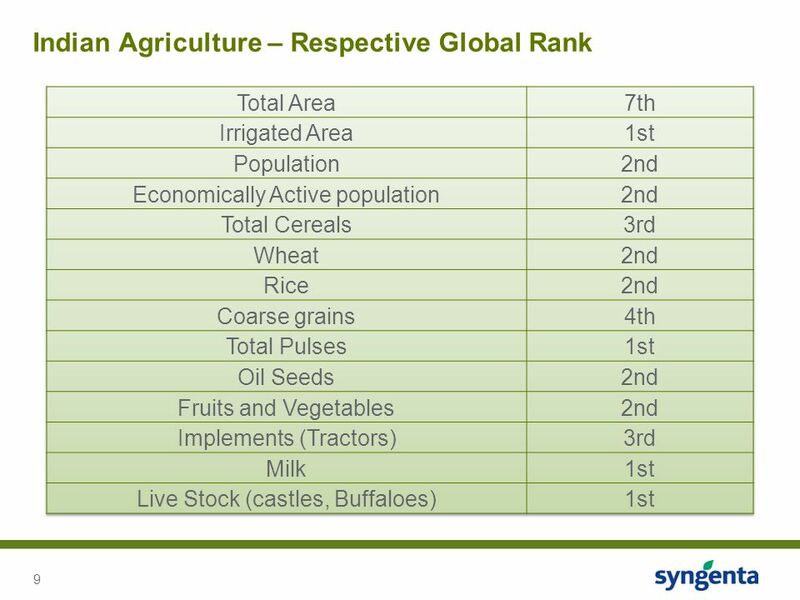 Second Largest producer of fruits & vegetables,wheat,rice,groundnut & sugarcane. Our major imports: edible oils (US $11 billion) and pulses (about US $ 3 billion). 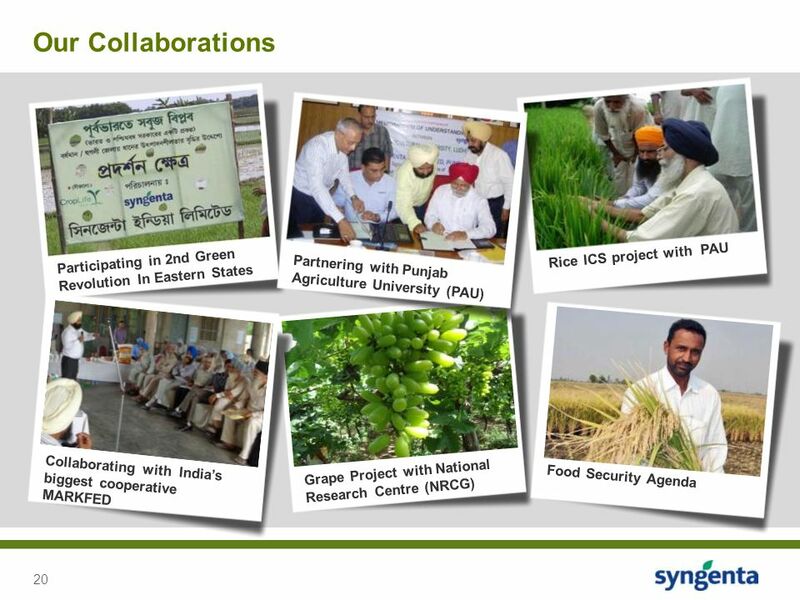 20 Our Collaborations Rice ICS project with PAU Participating in 2nd Green Revolution In Eastern States Partnering with Punjab Agriculture University (PAU) Collaborating with India’s biggest cooperative MARKFED Grape Project with National Research Centre (NRCG) Food Security Agenda GRES: In an effort to become ‘partners in progress’ in India’s agricultural growth, Syngenta is participating in the Government of West Bengal initiative to bring the Second Green Revolution in Eastern States. 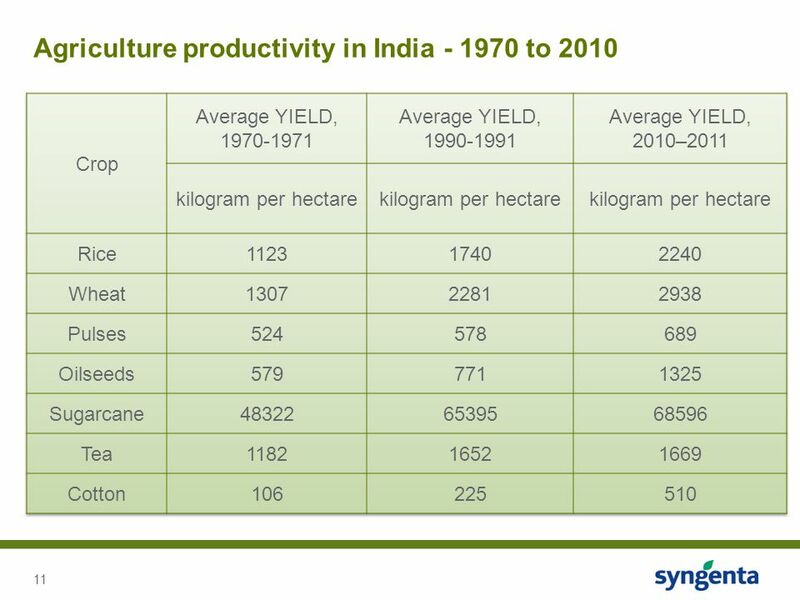 Through the project we seek to enhance rice output with hybrid paddy, responsible use of pesticides and integrated pest management in rice cultivation. 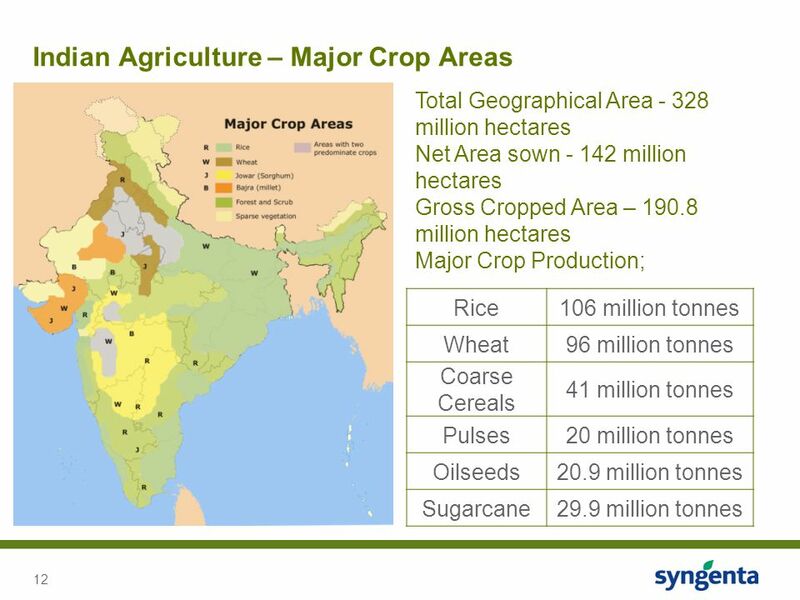 Syngenta’s project partners are the government of India’s Department of Agriculture & Cooperation, West Bengal’s Agriculture Department and CropLife India, part of global federation representing the plant sciences industry. MoU with Punjab Agriculture University (PAU): PAU is India’s leading farm university. It played a key role in bringing about the Green Revolution in Punjab and is an institution respected by farmers. 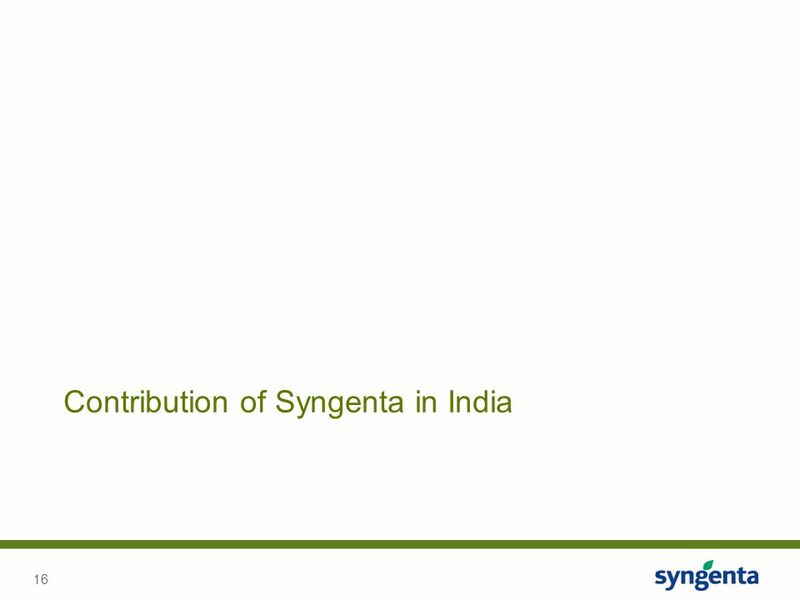 Under its public-private partnership program, PAU had first signed a MoU with Syngenta India in October 2008 and again in October 2011 to jointly undertake projects aimed towards sustainable development. 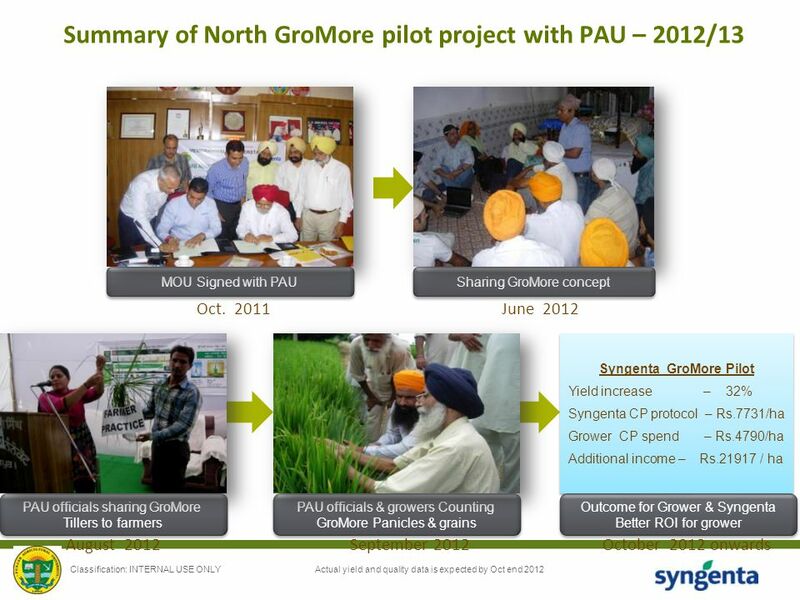 PAU and Syngenta have a singular aim, that of enhancing productivity and quality of farm produce in Punjab by adopting latest technology in key crops like Rice, Wheat and Potato. 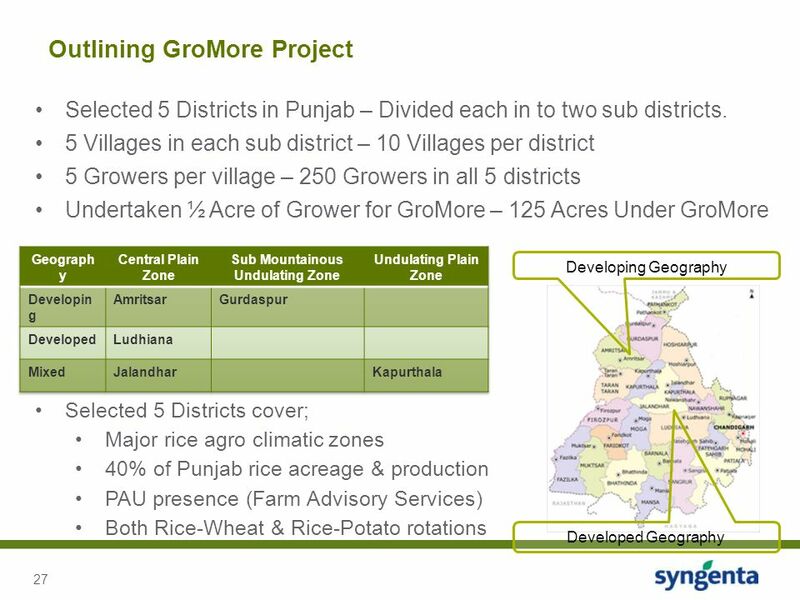 GrowMore project: After the announcement of Syngenta’s integrated crop strategy in early 2011, the Global and South Asia Territory Rice teams set out to understand the pain points of the rice growers in order to arrive at a holistic solution. 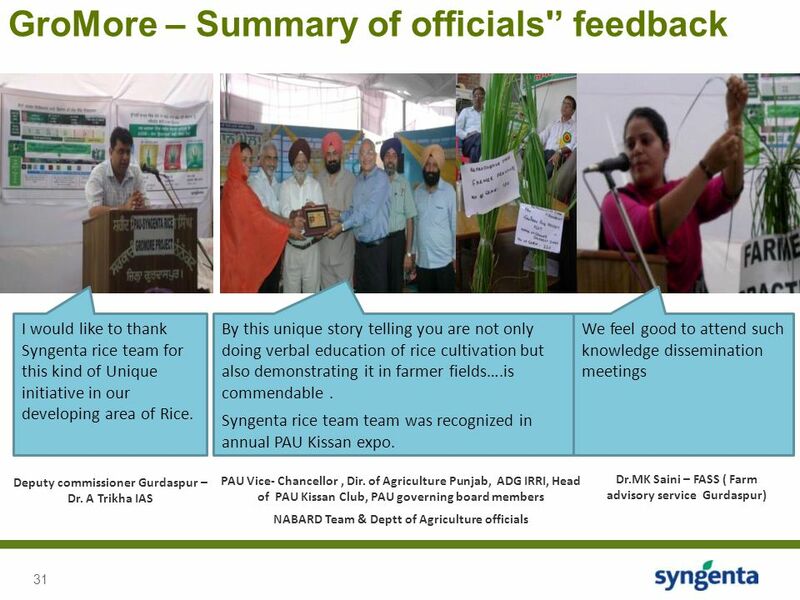 The outcome is GroMore which has proved to be an excellent fit in not only addressing the pain points of the farmers but also to address the food security challenge for an important crop like rice. This project in the North is a collaborative approach with PAU. 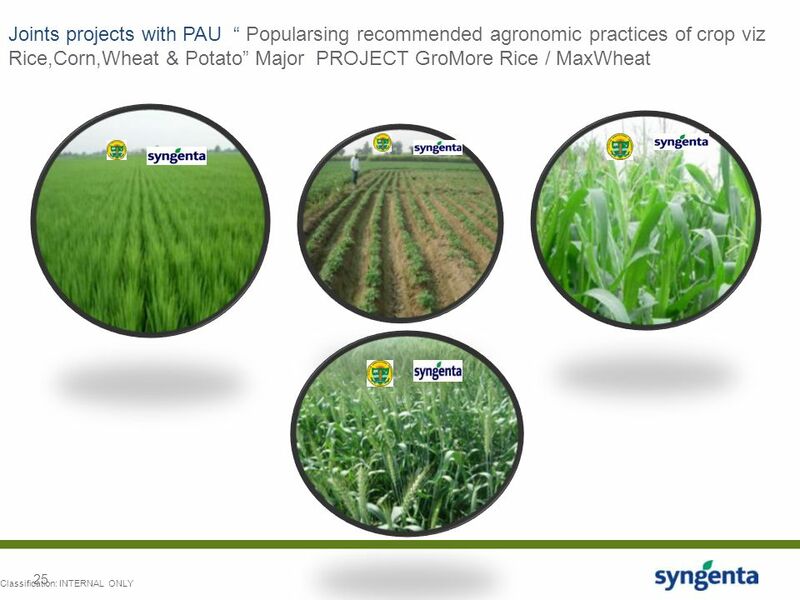 Other Projects with PAU: * Demonstrate 3R strategy to farmers: Right dose, at the Right time and with Right application technology. 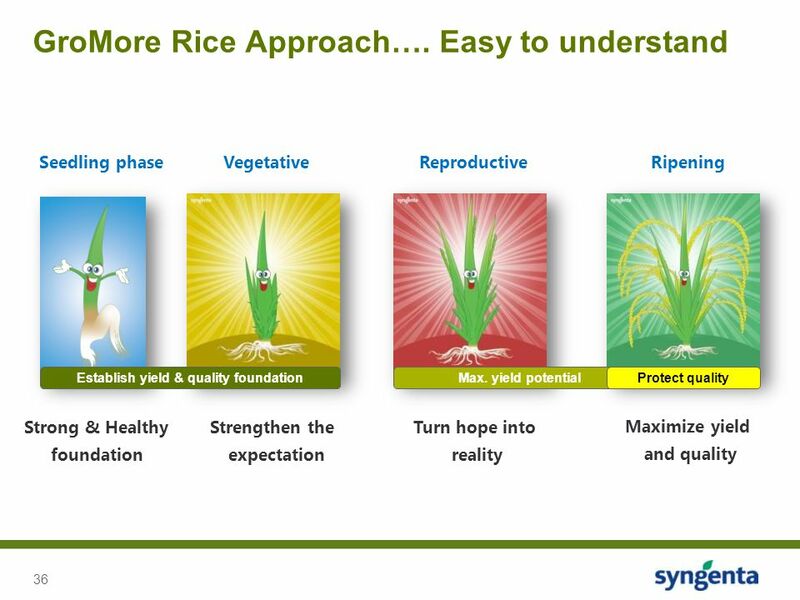 To educate farmers and applicators. • Corn Project: We undertook a comprehensive economic benefit study to help guide growers to adopt corn as a superior alternative over rice as well as in Corn-Potato-Corn rotation. • Wheat Project: This project aims to find the right program to effectively control resistant Phalaris and educate growers on how to effectively manage it with the right scientific method. • Potato Agronomy Project: This project considers productivity and quality enhancement through right agronomy and effective disease management in Potato. Its objective is to educate growers on overall agronomical practices at the key critical stages of Potato cultivation. • Herbicide Application Technology: The project demonstrates the use of new herbicide Axial in the control of Phalaris minor in wheat. The aim is to popularize herbicide technology spraying techniques and to enhance the productivity of Rice-Wheat cropping system. 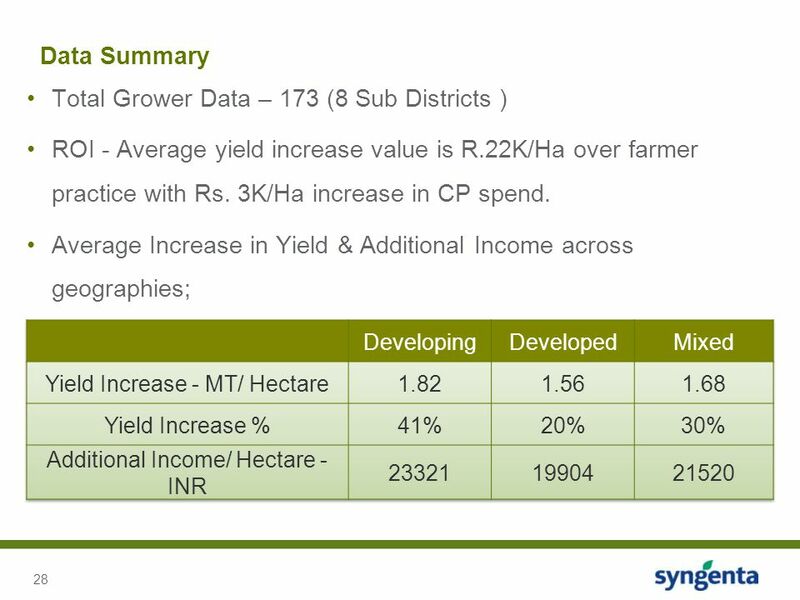 It has resulted in average yield increase of 13.6 per cent. MoU with MARKFED: To reach out to small land holding farmers, Syngenta has joined hands with one of the biggest cooperatives in Asia, MARKFED. 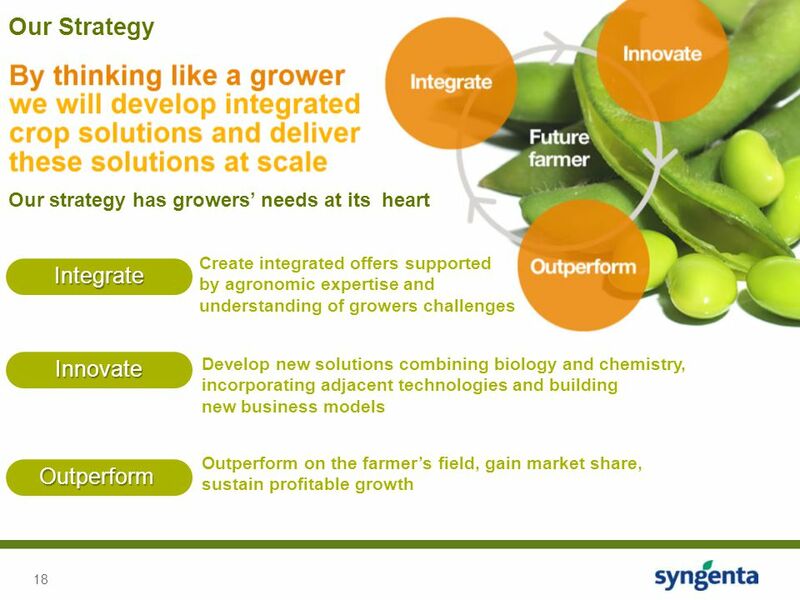 Syngenta is able to offer its solutions and services from nearly 3064 cooperative societies managed by MARKFED. 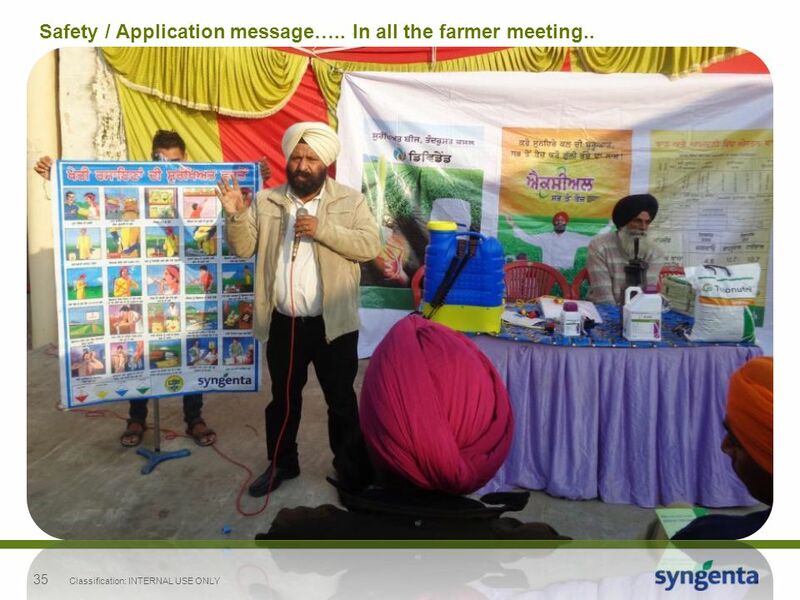 Its societies and retail outlets at various locations of Punjab provided the best channel to reach out to the growers. 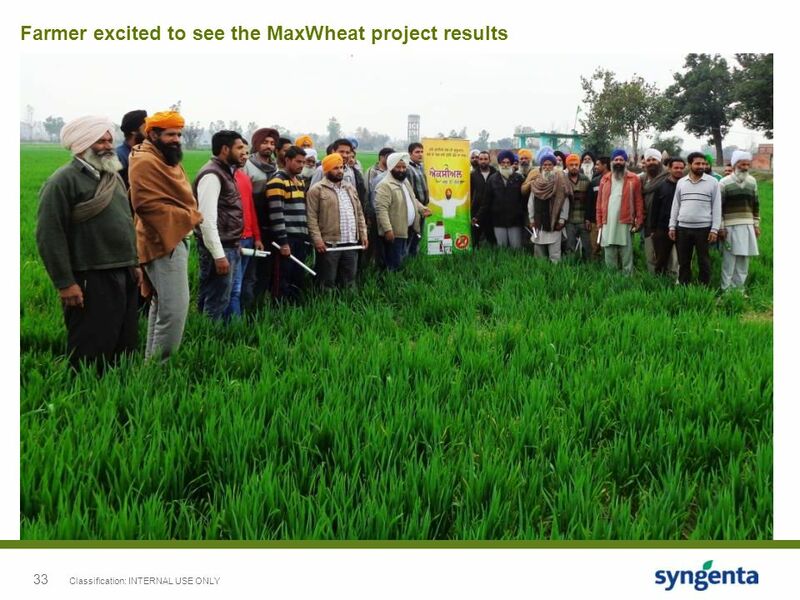 MoU with CIMMYT: CIMMYT (International Maize and Wheat Improvement Center) in India and Syngenta have been working together to develop multiple projects focused on wheat research activities. These are aimed at increasing cereal productivity by accelerating adoption of new genotypes, improved seed systems and improved crop management technologies including conservation agriculture. Grape Project with NRCG: Syngenta in association with National Research Centre for Grapes (NRCG) Pune has conducted a 2-year research project to establish and demonstrate effective pest and disease management in grape cultivation, using different crop protection products of Syngenta, to ensure quality grape production free from pesticide residues and which can be accepted into the high quality European market. The Food Security Agenda focuses on business models that address smallholder farmers and environmental sustainability. 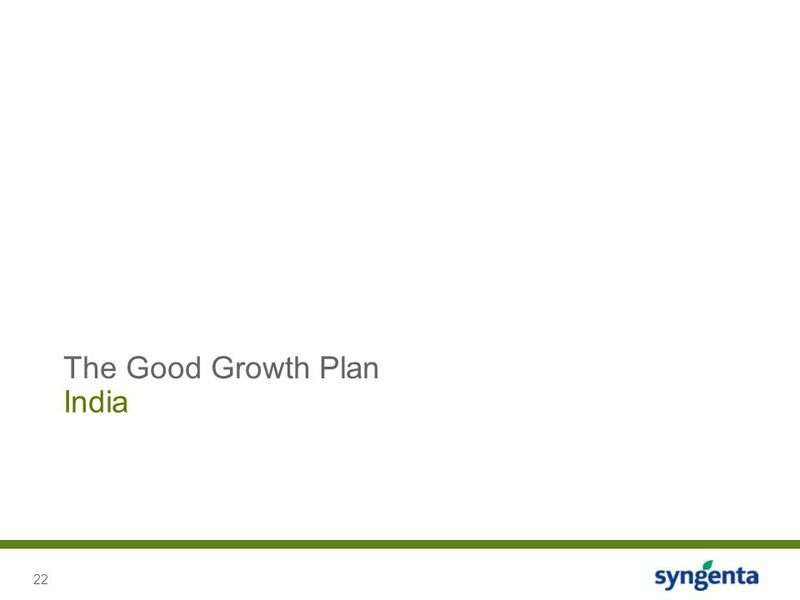 One such business model is being piloted in Odisha in rice growing smallholder areas. 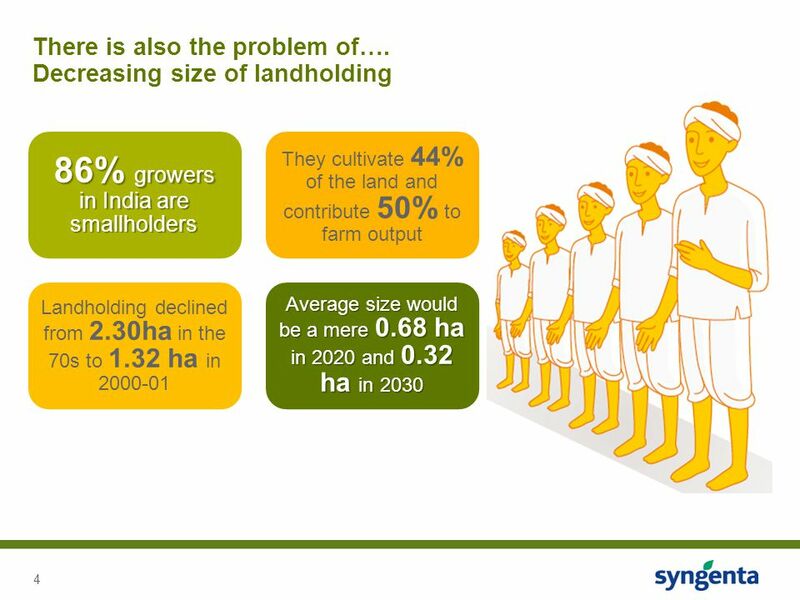 The model has Village Entrepreneurs who are 24x7 partners to growers. 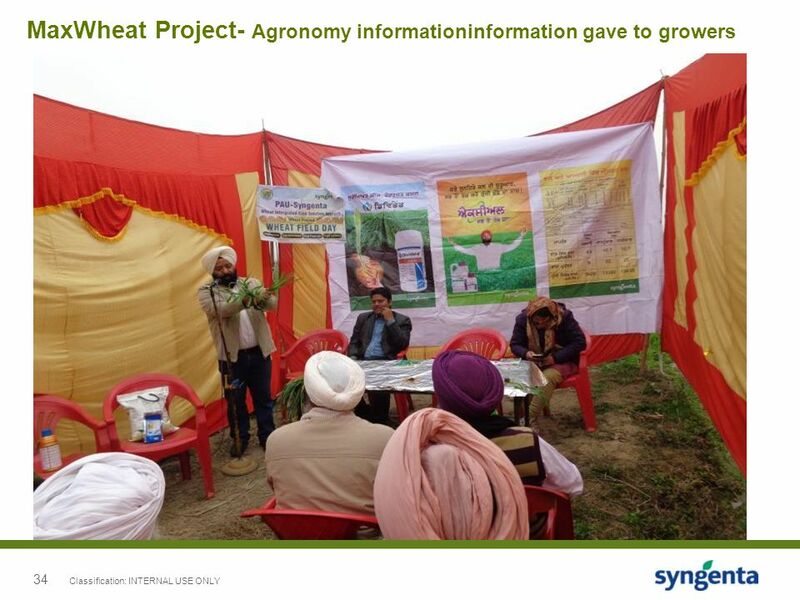 They provide advisory services to the growers and supply them with products made available from a “Centre of Excellence” established by Syngenta and partner organizations having allied products. Each entrepreneur covers about 500 farmers in villages. 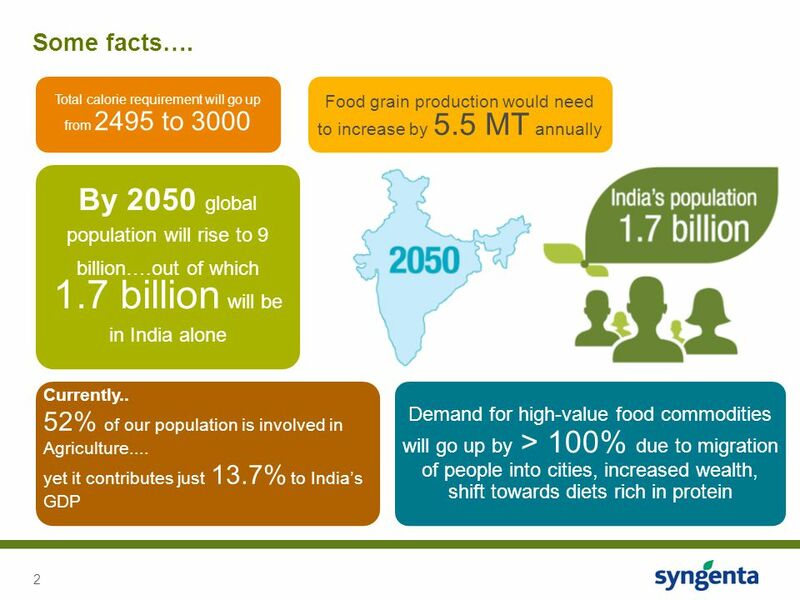 New Vision for Agriculture: Syngenta is also participating in the World Economic Forum’s New Vision for Agriculture (NVA) initiative with the Maharashtra government to improve productivity in vegetable production. Me & Mine addresses working conditions on seed farms We conduct HSE training for growers through Me & Mine Sparsh contibutes to education, skill development, women empowerment in Goa Syngenta Krishi Mitr gives innovative crop solutions to growers Syngenta Foundation India helps and trains smallholders Preserving the environment at our global supply base in Goa ‘Syngenta Me and Mine’: Improving quality of life in rural India. 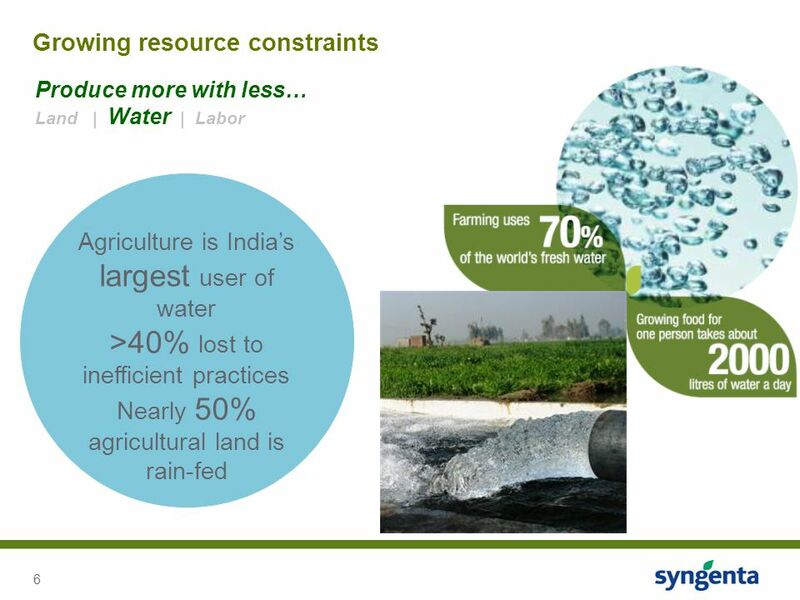 Syngenta’s flagship program “Syngenta Me and Mine” addresses working conditions on seed supply farms. It aims to eradicate child labor and unjust working conditions in the seed production farms. 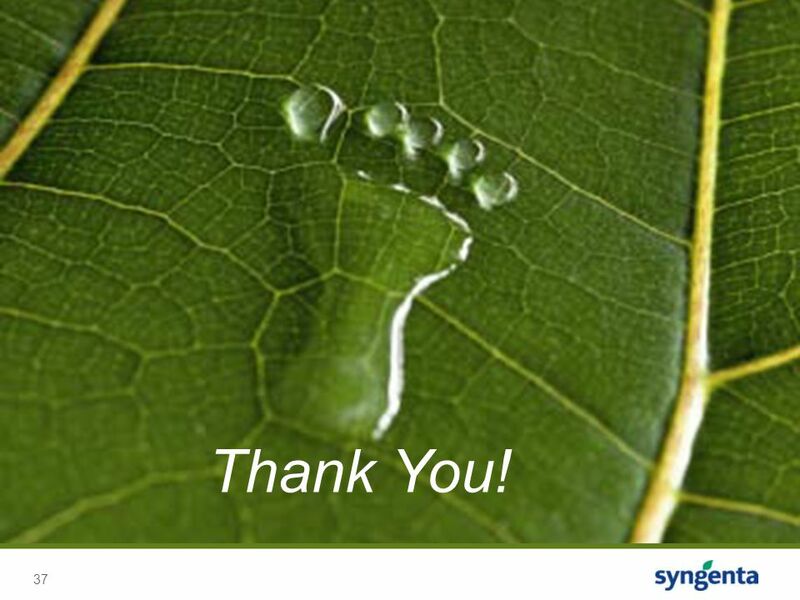 Preserving the Environment: Our global supply base Santa Monica Works (SMW) in Goa manufactures high quality, safe and technologically advanced crop protection agents. We have a scientifically designed effluent treatment plant where effluent is neutralized in a fully automated process and is subjected to bio-degradation by extended aeration method. A wild life sanctuary of birds and reptiles in the midst of our works is a source of pride for us and the show piece for everyone who visits Santa Monica. Sparsh: Santa Monica Works runs a CSR program Sparsh which contributes to areas of education, skill development, waste management, health and hygiene, women empowerment and support to socio cultural initiatives in the local community. 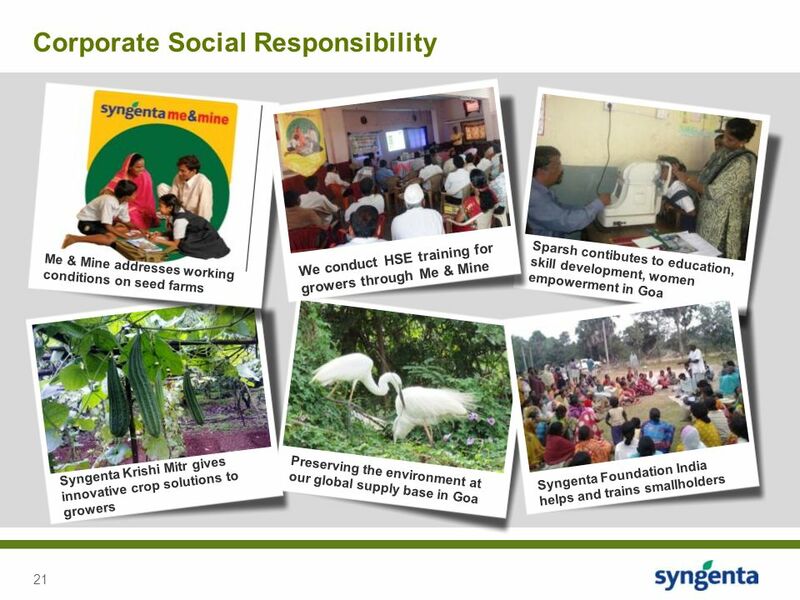 Syngenta Krishi Mitr was established in April 2010 with the purpose of engaging with the Goan Agriculture Community by developing a positive attitude towards agriculture using innovative crop solution and good agriculture practices. This helped to increase yield & quality of produce, contributing to economic growth & improved quality of life of the farming community. 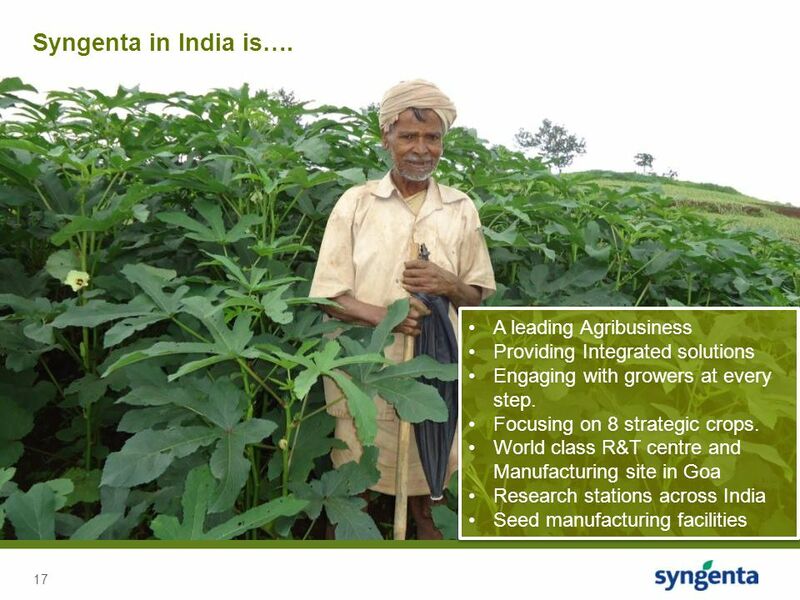 Syngenta India limited set up the Syngenta Foundation as an independent organization in 2005 to help marginalized farmers adopt new ways of agricultural production to enhance yield, and help in improving their livelihoods. The Foundation is working with a number of local NGOs and other associations on resource conservation and crop enhancement projects to provide long term productivity and income generation for the farmers. 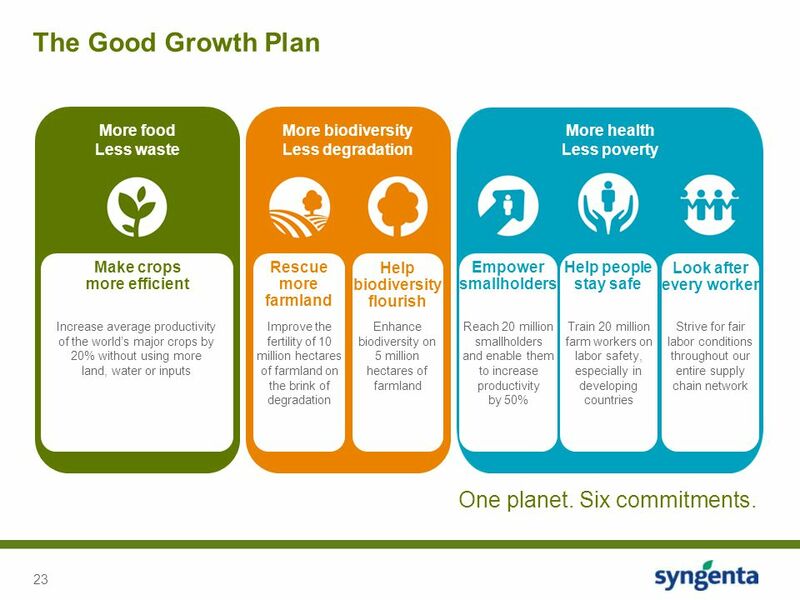 The Good Growth Plan More food Less waste More biodiversity Less degradation Rescue more farmland Improve the fertility of 10 million hectares of farmland on the brink of degradation Help biodiversity flourish Enhance biodiversity on 5 million hectares of farmland More health Less poverty Look after every worker Strive for fair labor conditions throughout our entire supply chain network Empower smallholders Reach 20 million smallholders and enable them to increase productivity by 50% Help people stay safe Train 20 million farm workers on labor safety, especially in developing countries Make crops more efficient Increase average productivity of the world’s major crops by 20% without using more land, water or inputs We are launching The Good Growth Plan which includes six specific commitments to address critical challenges the world faces in feeding a growing population. By 2020, we commit to: Make crops more efficient: Increase average productivity of the world’s major crops by 20 percent without using more land, water or inputs Rescue more farmland: Improve the fertility of 10 million hectares of farmland on the brink of degradation Help biodiversity flourish: Enhance biodiversity on 5 million hectares of farmland Empower smallholders: Reach 20 million smallholders and enable them to increase productivity by 50 percent Help people stay safe: Train 20 million farm workers on labor safety, especially in developing countries Look after every worker: Strive for fair labor conditions throughout our entire supply chain network One planet. Six commitments. 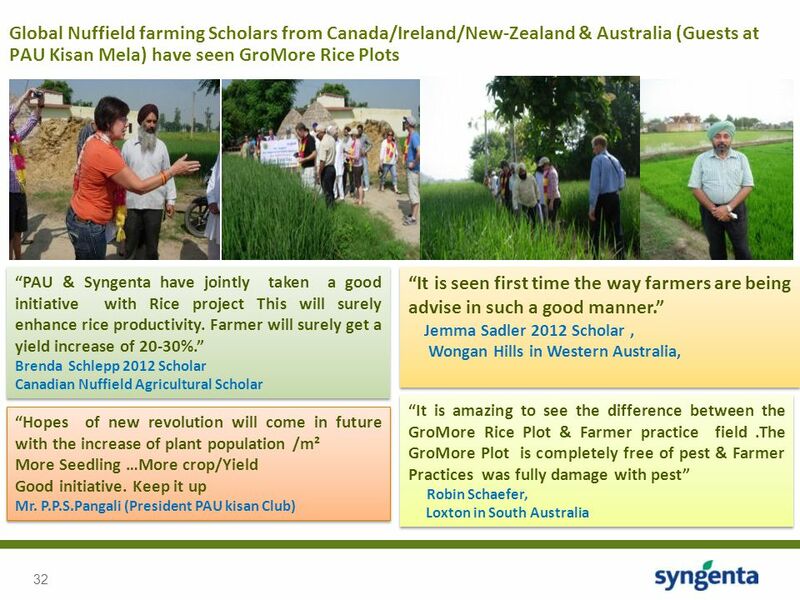 24 India Examples GroMore an integrated rice solution comprising of simple protocols offering timely advice ‘in the language of the farmer’ to establish and protect the crop, delivering immediate yield increases of up to 30%. 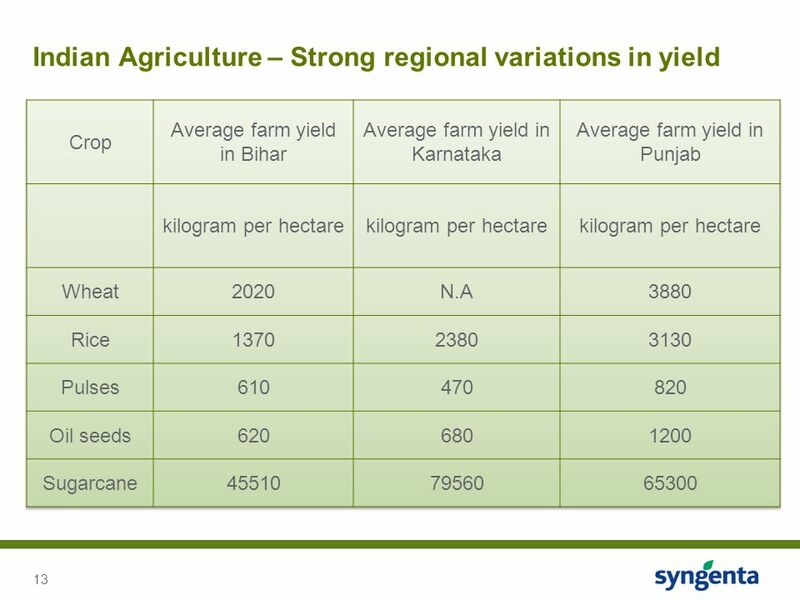 Tegra™: Piloted in South India in An integrated growing system, delivering more productive tillers and a yield increase of up to 30%. 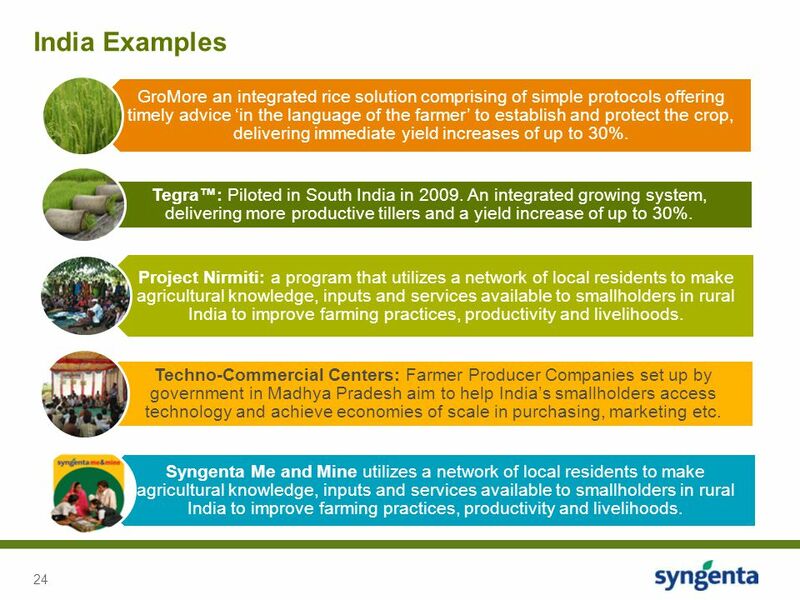 Project Nirmiti: a program that utilizes a network of local residents to make agricultural knowledge, inputs and services available to smallholders in rural India to improve farming practices, productivity and livelihoods. Techno-Commercial Centers: Farmer Producer Companies set up by government in Madhya Pradesh aim to help India’s smallholders access technology and achieve economies of scale in purchasing, marketing etc. 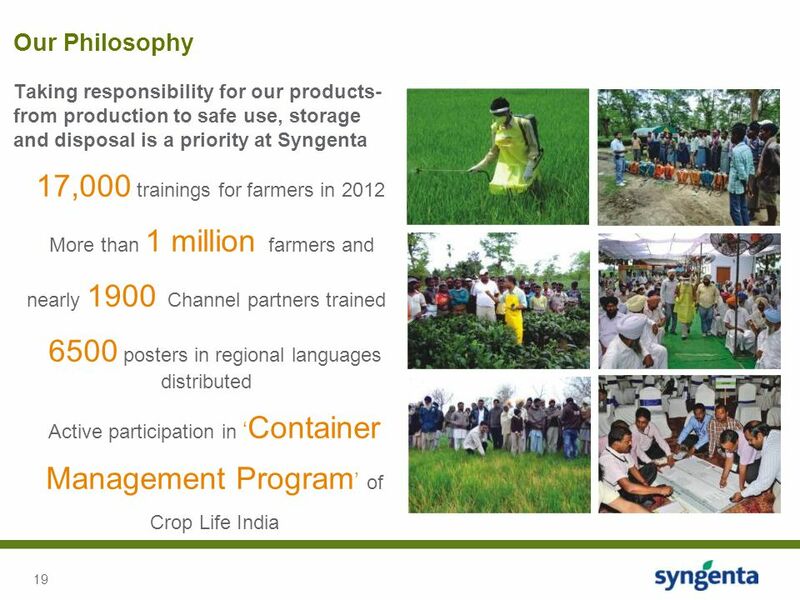 Syngenta Me and Mine utilizes a network of local residents to make agricultural knowledge, inputs and services available to smallholders in rural India to improve farming practices, productivity and livelihoods. 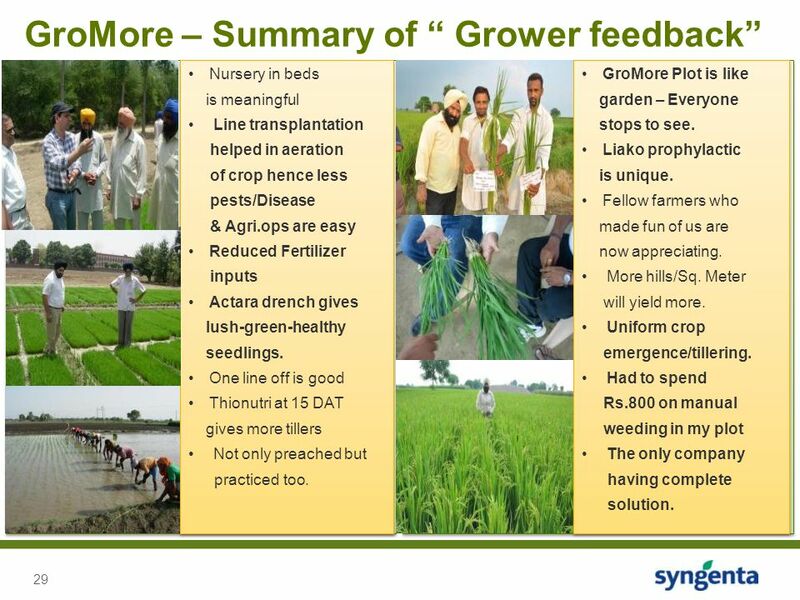 Nursery in beds is meaningful Line transplantation helped in aeration of crop hence less pests/Disease & Agri.ops are easy Reduced Fertilizer inputs Actara drench gives lush-green-healthy seedlings. One line off is good Thionutri at 15 DAT gives more tillers Not only preached but practiced too. GroMore Plot is like garden – Everyone stops to see. Liako prophylactic is unique. Fellow farmers who made fun of us are now appreciating. More hills/Sq. Meter will yield more. Uniform crop emergence/tillering. Had to spend Rs.800 on manual weeding in my plot The only company having complete solution. 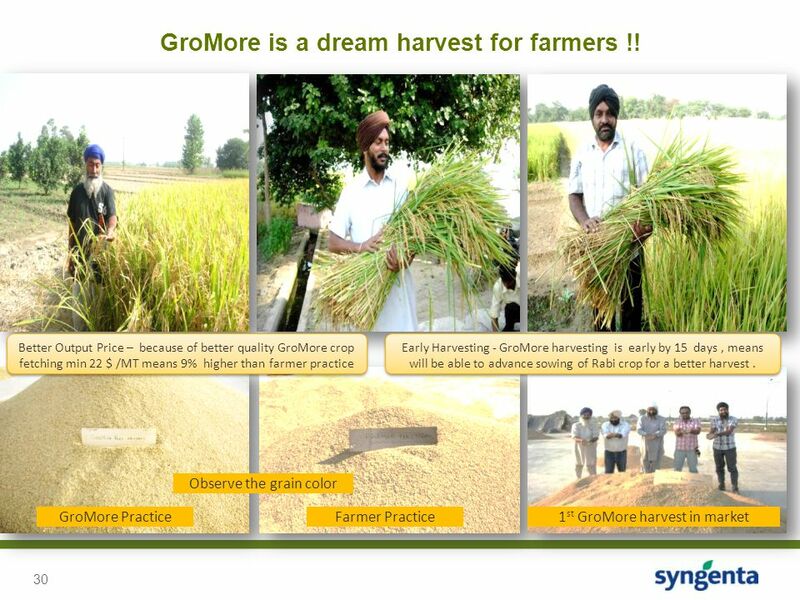 30 GroMore is a dream harvest for farmers !! 35 Safety / Application message….. 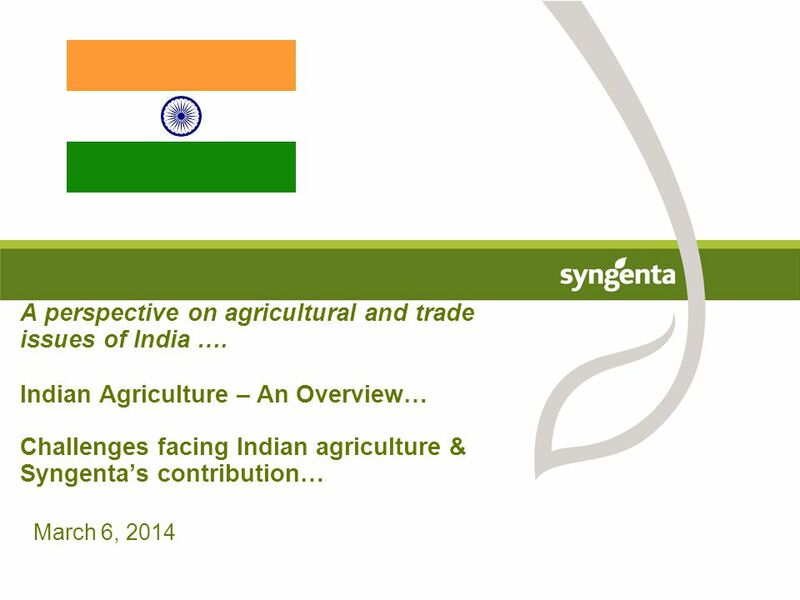 In all the farmer meeting..
Download ppt "A perspective on agricultural and trade issues of India …"
March 20, 2014 Syngenta’s contribution to the corn business in India. 4 th Global Agenda of Action in Support of Sustainable Livestock Development Susanne Thalwitzer – October 2013, Ottawa, Canada CHALLENGES FOR SUSTAINABLE. 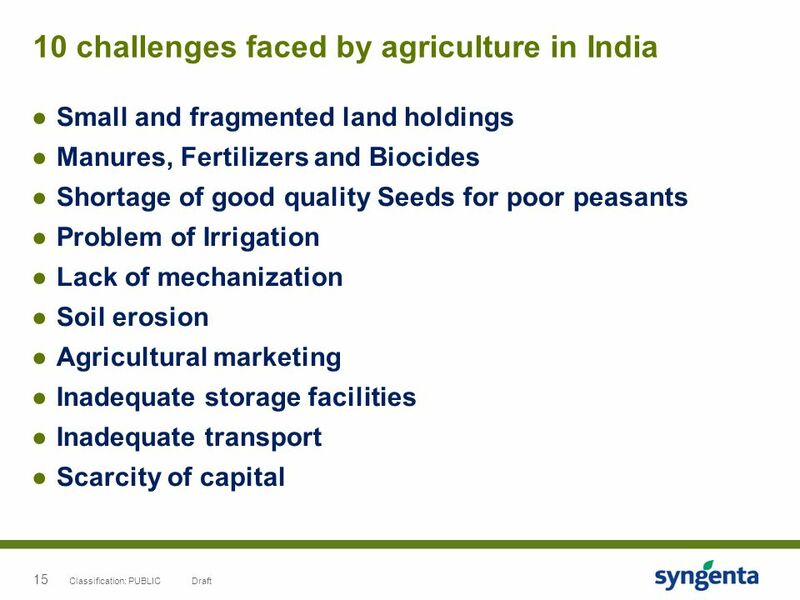 AGRICULTURE and DEVELOPMENT Cypher and Dietz, Ch. 11. 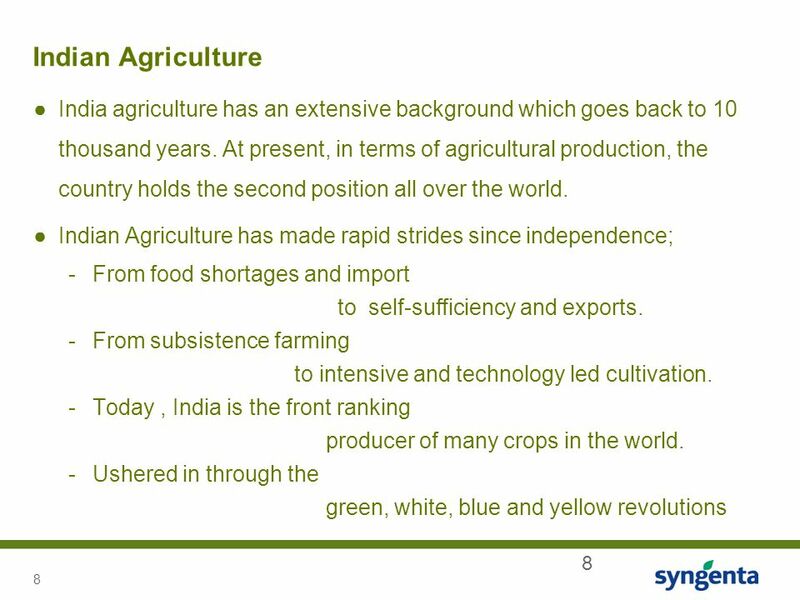 Food and AgricultureSection 1 Bellringer. Food and AgricultureSection 1 Objectives Identify the major causes of malnutrition. Compare the environmental. 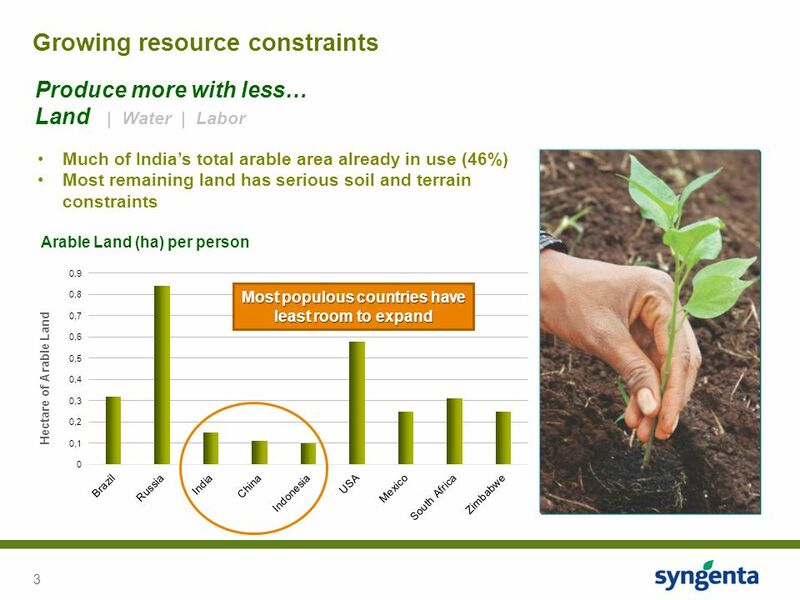 Feeding the world involves soil and water resources, food production, social and cultural issues, food distribution and environmental impacts. 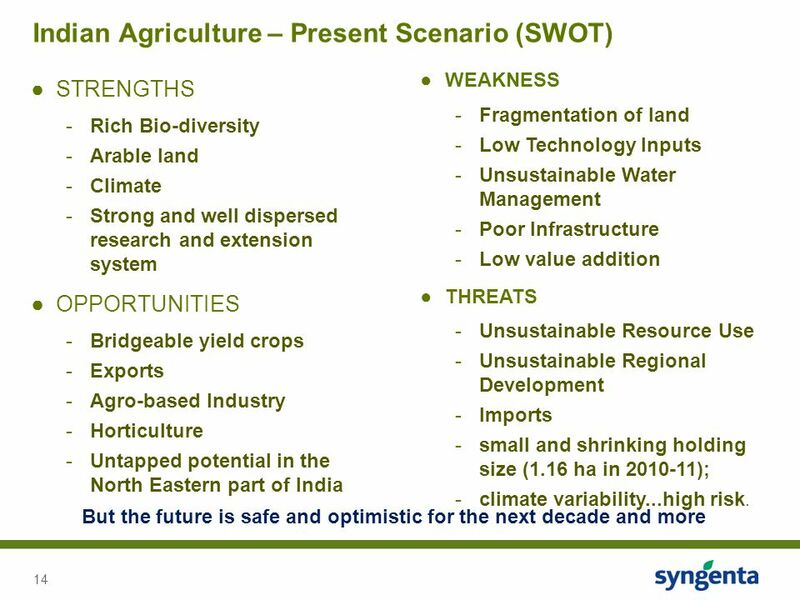 1 Sustainable Agriculture strategy Zurich 8 th June 2011 Neil la Croix Director of Supply Chains. 4 th Global Agenda of Action in Support of Sustainable Livestock Development Susanne Thalwitzer – 15-17 October 2013, Ottawa, Canada CHALLENGES FOR SUSTAINABLE.